12 Barnacle Geese flew through and just single Curlew Sandpiper and the Turtle Dove were seen. Passerines included a Richard's Pipit, a Flava Wagtail, 6 Robin, 5 Redstart, a Ring Ouzel, 41 Blackbird, 37 Song Thrush, 5 Redwing and a Mistle Thrush. Warblers are still in low numbers with just 2 Blackcap, a Yellow-browed at westness, 6 Chiffchaff, 2 Willow and 14 Goldcrest. 2 Spotted and 3 Pied Flycatcher were seen while Brambling numbers had risen to 21. 156 Lapland and 96 Snow Buntings were counted. 2 Hen Harriers a Sparrowhawk and 2 Peregrines were seen. Amonst the waders on the island there were 678 Golden Plover, 1 Grey Plover, 224 Sanderling, 3 Curlew Sandpipers, 1 Jack Snipe, 189 Snipe, 78 Curlew, 101 Redshank and 308 Turnstone. The Turtle Dove was still around and 210 Meadow and 28 Rock Pipit were counted. There were single Redstart and Whinchat seen along with 17 Wheatear, 3 Song Thrush and 2 Redwing. Warblers consisted of single Barred and Lesser Whitethroat, 2 Garden, 4 Blackcap, 1 Yellow-browed, 5 Chiffchaff, 6 Willow and 2 Goldcrest. 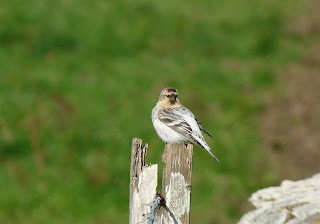 Singles of Spotted and Pied Flycatcher were around and 12 Common Redpoll were seen. Buntings included a new record count of 272 Lapland as well as 90 Snow and 1 Little. On the 25th five hours seawatching from 1330 produced; 214 Sooty Shearwaters, 4 Manx Shearwaters, 176 Gannet but just 20 Fulmar. The best of the wader counts was 765 Golden Plover, 111 Lapwing, 51 Knot and 354 Sanderling. A juvenile Glaucous Gull was seen from the links. The Turtle Dove was still around and passerines consisted of 1 Whinchat, 1 Song Thrush, 1 Lesser Whitethroat, 1 Blackcap, 1 Chiffchaff, 3 Willow Warbler and an unstreaked acrocephalus sp ( strongly believed to be a Reed ). The Arctic Redpoll was still at kirbest and a Rostrata type Redpoll was nearby. The Lapland bunting count for the day was 107. The 26th saw 3 Mute Swan, 2 Hen Harrier and singles of Merlin, Kestrel and Peregrine. 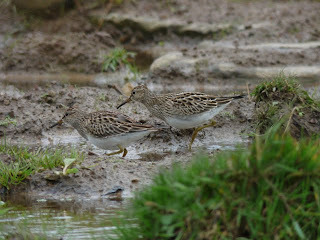 Sanderling had risen to 425 and 3 Curlew Sandpiper, a Jack Snipe and 235 Snipe were counted. 188 Meadow Pipit were counted and the count of 15 Rock Pipit was the highest count for some time. 2 Flava Wagtails were seen along with 3 Whinchat, 4 Song Thrush and a Redwing. Warbler numbers were up slightly with 2 Lesser Whitethroat, 3 Garden Warbler, 1 Yellow-browed, 4 Chiffchaff, 2 Willow and a Goldcrest. 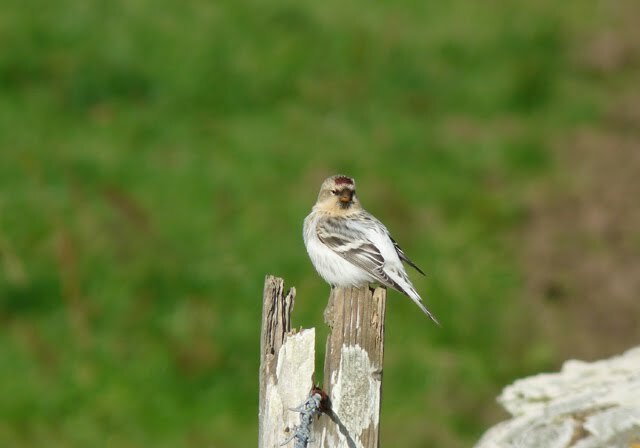 6 northwestern Common and the Arctic Redpoll were seen, 208 Lapland Bunting was once again a new island record count and 24 Snow Bunting were seen. On the 23rd seawatching produced 7 Sooty and 3 Manx Shearwater, 178 Wigeon and 238 Teal were good wildfowl counts and 2 Culew Sandpipers were seen. The Turtle Dove was around again and a Black Redstart was new. A Common Rosefinch was at holland. The Arctic Redpoll was seen again on the 24th when there was also a Rostrata type Common Redpoll, a Greenshank, 120 Sanderling, the Turtle Dove and 27 Lapland Bunting. On a very wet day recording was hampered a little. A short seawatch produced 3 Manx Shearwaters and a single Storm Petrel. Pink-footed Geese were on the move with 229 counted. The American Golden Plover was still at lenswick and a Turtle Dove was new. Just a single Lesser Whitethroat and 2 Spotted Flycatchers were seen. 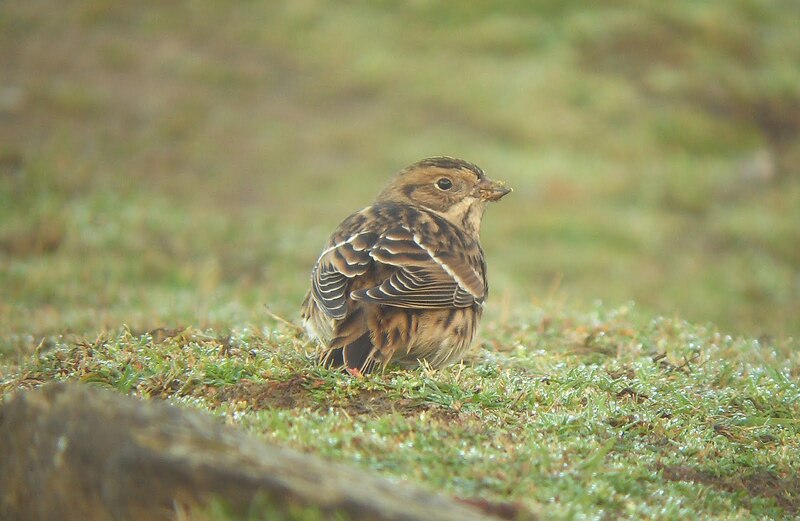 67 Lapland Bunting and 22 Snow Bunting were around the island. On what was a predominantly wet day still a few things were seen. 5 Red-throated Diver were the first for a while, 3 Pink-footed Geese were with the Greylags and 5 Gadwall were on gretchen. A Peregrine and 2 Merlin were the raptors seen and the best wader counts were; 67 Ringed Plover, 597 Golden Plover, 3 Grey Plover, 173 Snipe and 83 Black-tailed Godwits. 51 Skylark was a reasonable count as was 174 Meadow Pipit, there were single Redstart, Whinchat and Fieldfare and warblers consisted of single Lesser Whitethroat, Blackcap and Willow Warbler and 2 Yellow-browed Warblers were the first of the year. 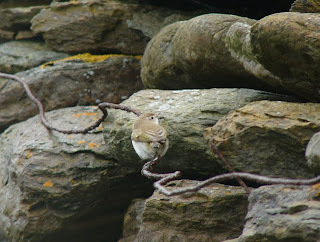 2 Spotted and a Pied Flycatcher were in holland and the Hornemanns Arctic Redpoll was still with Linnets at kirbest. 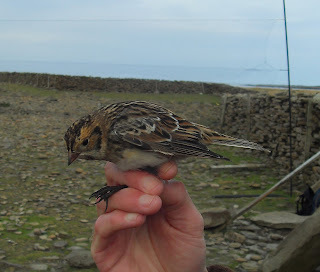 68 Lapland Buntings where dotted around the island. The American Golden Plover was still in its favoured field today when there were also 7 Curlew Sandpiper and 58 Black-tailed Godwit. 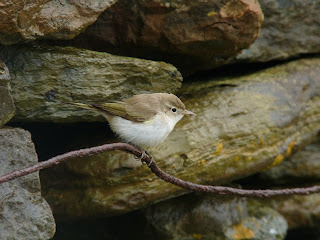 A saewatch saw 642 Fulmar, 7 Sooty and a single Manx Shearwater. 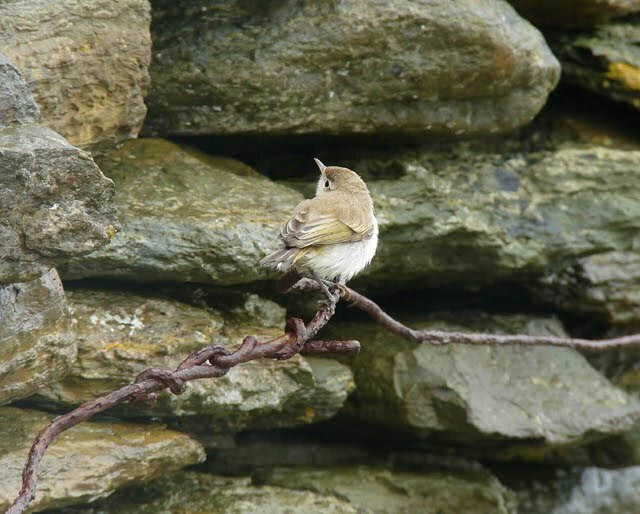 Passerines consisted of 110 Meadow pipit,5 White Wagtail, 1 Robin, 1 Redstart, 3 Whinchat, 1 Sedge Warbler, 2 Lesser Whitethroat, 4 Spotted and 1 Pied Flycatcher, a Common Rosefinch and best of all a Hornemanni Arctic Redpoll. On the 14th there were 396 Meadow Pipit, 47 Wheatear, 1 Barred Warbler, 4 Spotted Flycatcher, a Red-backed Shrike, 16 Siskin and the first Snow Bunting of the autumn. The 15th produced 86 Black-tailed Godwit, 3 Flava Wagtails and 26 Lapland Bunting. 8 Sooty Shearwaters were seen on a seawatch on the 16th when there was also a Pectoral Sandpiper and 253 Meadow Pipits were counted. The 17th produced 2 Pectoral Sandpiper at Kirbest mire ( they were seen to the 19th ), also there were 3 Whinchats, 31 Lapland Buntings and 2 Snow Buntings. A seawatch on the 18th produced 787 Fulmar including 2 blue birds, 56 Sooty Shearwaters and 7 Manx Shearwaters. 3 Snow Buntings where arond Trolla Vatn and 5 Blackcaps and 2 Lesser Whitethroats were at Holland. Another seawatch on the 19th saw 1532 Fulmar including 1blue, 23 Sooty Shearwater, 14 Manx Shearwater, 594 Gannet and 92 Kittiwake. 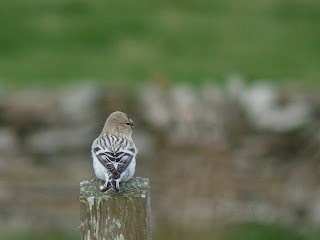 There were 4 Spotted Flycatcher and 48 Lapland Bunting. An excellent period with strong South Easterly winds and rain giving a good spread of common migrants in good numbers with peak counts of passerines including 12 Tree Pipit, 2 Robin, 37 Redstart, Whinchat 11, Wheatear 110, Fieldfare 7, 5 Song Thrush, a Redwing, 2 Grasshopper Warbler, 2 Sedge Warbler, 2 Reed Warbler, 2 Lesser Whitethroat, a Whitethroat, 17 Garden Warbler, 28 Blackcap, 48 Willow Warbler, 32 Spotted Flycatcher, 3 Pied Flycatcher, 9 Chaffinch, 2 Brambling, 30 Siskin and again a new Lapland Bunting record with 135 on 12th. 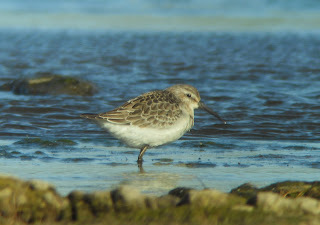 Waders also featured well with the American Golden Plover still present on 12th and counts of up to 4 Common Sandpiper, 8 Curlew Sandpiper, 17 Ruff, a record 107 Black-tailed Godwit on 10th, 179 Snipe, 157 Sanderling, 67 Dunlin, Little Stint, Wood Sandpiper, Greenshank, Whimbrel and Jack Snipe. Scarcities included, Quail and Corncrake on 12th, Pectoral Sandpiper, up to 6 flava Wagtails (presumably grey-headed), Icterine Warbler on 12th, and an absolute minimum of 5 Wrynecks, 2 Common Rosefinches, and 3 Barred Warblers during the week. The quality birds however were on the 10th, with a Bonnelli's Warbler found at Cott Banks (trapped and confirmed as Western on the 11th) and a Citrine Wagtail . 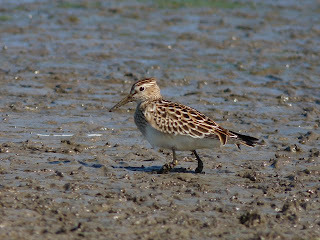 A juvenile Pectoral Sandpiper spent the day on Gretchen, with 2 Curlew Sandpiper, 2 Ruff and 26 Dunlin, whilst the American Golden Plover stayed faithful to its patch at Lindswick. 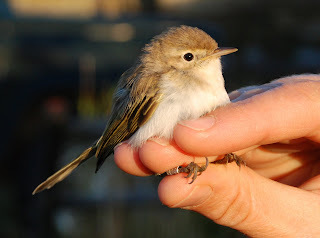 Small passerines finally started to arrive by the afternoon with 6 Willow Warblers, a Pied Flycatcher and a Whinchat. 2 Common Tern in Linklet Bay are the first this year and 46 Lapland Buntings were seen. The American Golden Plover was still present and Lapland Bunting numbers had dropped to 22. A Ruff was on Gretchen Loch with 21 Black-tailed Godwit, 5 Arctic Terns were Lingering in Nouster Bay and just a single Willow Warbler was seen elsewhere. 72 Lapland Bunting was again a large count with the majority at Trinley. The American Golden Plover was still at nearby Lindswick and a Greenshank flew south along the West side. A kestrel was new but representing smaller migrants were just a willow warbler at Holland and a White Wagtail. On the 1st 60 Storm Petrels were counted on a sea-watch and 32 were caught over-night. The American Golden Plover was still present, singles of Sedge and Barred Warbler were seen and the Lapland Bunting count went to a new island record of 104. An attempt at catching the buntings was successful with nine birds being caught, only six had ever been ringed on the island before. The 2nd saw 350 Wigeon on ancum loch, a reasonable Swallow count of 62, Wagtail numbers consisted of 12 Pied, 40 Alba and at least one White. The Barred Warbler was still around holland and three Willow Warblers were seen.